I need something more valuable than gold... your knowledge! 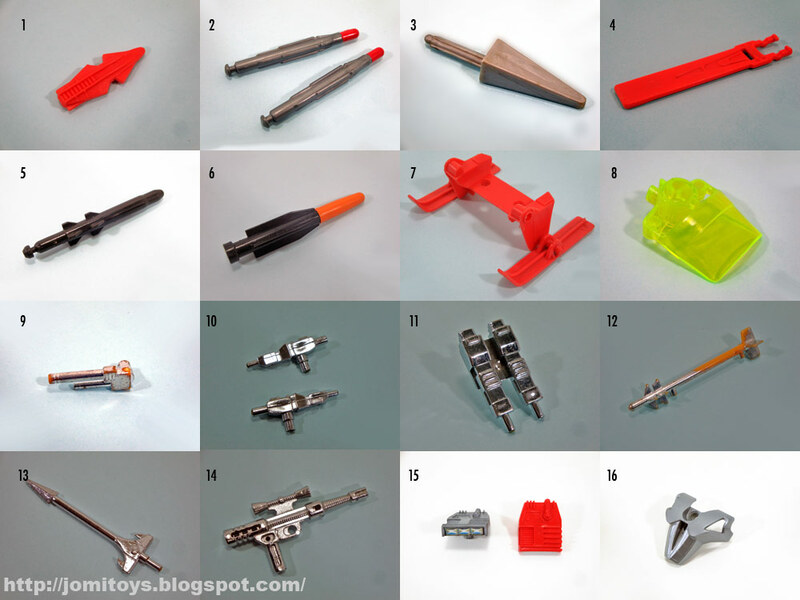 I´m betting that just like me, you have built a pile of parts from a wide range of collections. And from time to time, you go searching the web trying to identify this or that part. Sometimes, you can even come across this or that site and voilà, there it is, the part eluding you for so many years! I have helped identifying hundreds of parts as figures and vehicles. And sometimes I even get a kick out of it, and in the same spirit, I´ll try my luck with my dear friends and see how you can help me out here! Most if not all these parts came with lots... of lots of action figures (parts, accessories, etc). I´m guessing some belong to obscure figures and/or brands. But some may eventually belong to "mainstream" lines from TF to Turtles, Biker Mice or Fantastic4. These images are not scaled, so I used a quarter (25 cents) of a dollar when it was difficult to determine the size just by looking. 48- Robo Force Dred Crawler by Ideal, 1984. 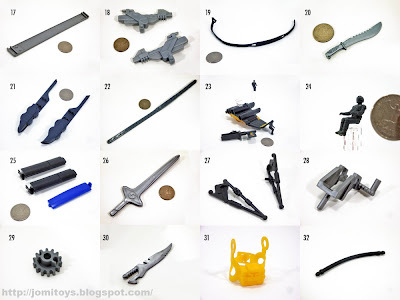 Some of these really look cool, and cool stuff generally belongs to a cool line. Just like the accessories, I have a ton of incomplete figures and vehicles, and some of them are next to impossible to find info about. Hence the idea of reaching out to my dear friends and followers so that we together may find a way to post another complete set here! And obviously if the parts are not needed, those who identify them will have first dibbs! Yeah, it´s a hard job. 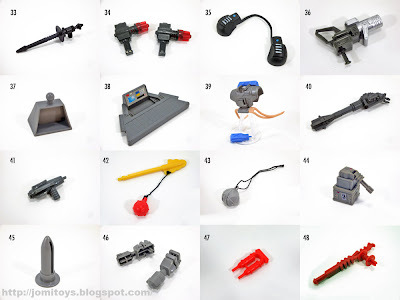 I manage to find pretty much all of them, but it takes days, weeks, even months and years to come across the right images, loose (since MIB or MOC raraely help). Since this post, I already foun half a dozen of them. Great sites like www.figurerealm.com help a lot. Auctions too, and so on and so forth. That's how I found an image for that "whip" weapon for Cloudburst. Glad you're able to figure those out. Thanks for the link! No problem! There are quite a few cool sites like action figure archive. Pretty awesome work there too. 62: Power Rangers first series. Black Ranger weapon. "Anonymous", you´re the man (or woman). Thank you for your help! I think I recognize 16. That's a Lego Piece for their Bionicle line... I think. The 63 it´s a Playmobil item from 3531 set. @ Machado100: I was suspicious it could be Playmobil, since the handles fit the figures. Thanks! 45. Looks like lego technick or k´nex parts. I have the 55 too, still unknown. Thanks RBL. 55 is a Dino Riders weapon. Oh, I said, 45. It´s actually 49 that looks some parts form lego technick o k´nex. 39. I saw a pringload gun like that in a rebranded pack of various dinosaur and action figures close to chapmei but some bigger and in a more childist style at Carrefour. #53 looks like a Mighty World cement block. Thanks garsh! You seem to be right!!! I think that #15 are a part of the Doomcycle (grey) and Turbocycle (red) from Mattel's Secret Wars series. They were vehicles (a motorcycle with a sidecar) for the superheroes and villains of Marvel. The parts go on top of a fin at the end of the seat for the pilot. Congratulations for the good and interesting blog. Javier, thanks. I actually found that a couple of weeks ago when I posted the Turbocycle, but I DO appreciate your contribution! Thank you for the comment. I will refresh the pictures set and start a new cycle! So maybe it's from something else from Remco? Moonchild666 is ripping!!! Thank you! #30 is from Toybiz (Charan Toy) Wolverine 5th edition. #64 is a Macross Valkyrie rifle. It is hollow, so it is from a scale like 1:100 or smaller. Thank you formbx257, guys you should really check out his reviews on youtube, great stuff! Thanks for helping ME identify a part like number 48!